Launched in the United States in 2012 as the Infiniti JX, this seven-passenger SUV is this Japanese luxury manufacturer’s first vehicle to be 100 percent built in America. 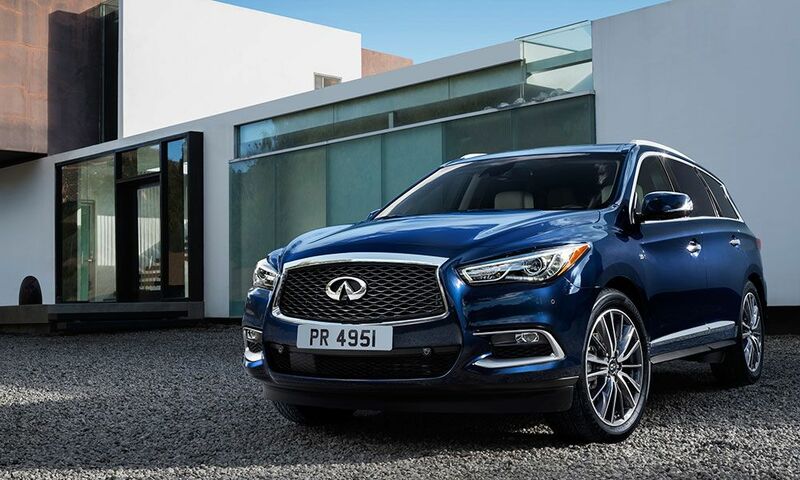 Rechristened the QX60 in 2014 to align with Infiniti’s new naming system, the mid-size premium crossover gets a mid-cycle refresh for the 2016 model year to better compete against the Acura MDX, Audi Q7, Volvo XC90, and BMW X5. It has updated exterior design cues, new interior luxury touches, retuned chassis dynamics, and a comprehensive suite of comfort, convenience, and safety technologies. Outside, the QX60’s revised form accentuates its looks that are an appealing blend of power and elegance with familiar signature brand design features like Infiniti’s double-wave hood and crescent-cut D-pillar. The dramatic double-arch front grille sports standard bi-xenon headlamps and LED daytime running lights; restyled lighting extends along the profile and rear, with side indicators and taillights that sit flush to the body and incorporate the turn signals in red. The smooth and aerodynamic styling benefits from a front underbody spoiler, integrated rear spoiler, and rear tire deflectors to manage airflow over, under, and around the exterior that promote road holding and high-speed stability, as well as improved fuel economy. The interior has an ambiance of elegance and fine craftsmanship with thin chrome accents, uplevel soft-touch materials, and standard leather seating trim with contrast stitching. Three-layer acoustic side glass minimizes wind and tire noise. A flat platform floor and split-fold seating enhance flexibility and increase interior space for a total of 149.8 cubic feet. Second-row seating slides fore and aft by six inches as needed to benefit passenger legroom or increase rear cargo space; this sliding feature also negates the need to remove a child seat strapped into the second row, when accessing the third row. Traditionally a tight space, the third row can accommodate children or adults with impressive head-and knee room; behind is 15.8 cu.-ft. of stowage. Available in both front- and all-wheel-drive versions, the QX60 is offered with a choice of two powerful and efficient powertrains. Standard is a 3.5-liter V-6 gasoline engine that makes 265 horsepower at 6,400 rpm with peak torque of 248 lb.-ft. at 4,400 rpm. Optional is a hybrid powertrain; a supercharged 2.5-liter inline-four-cylinder engine is paired with an electric motor powered by a compact Lithium-ion battery pack to produce a total of 250 horsepower and 243 lb.-ft. of torque. Both are mated to a sport-tuned, electronically controlled continuously variable transmission featuring Infiniti’s D-Step transmission logic that adjusts the shift feel of the CVT to mimic the shift patterns of a more traditional step transmission. A manual shift mode allows the driver to select from the preset gear ratios, if preferred. Fuel economy is estimated at 21 mpg city, 27 mph highway (FWD) or 19/26 (AWD). An Infiniti Drive Mode rotary selector lets the driver dial in one of four drive modes –- Standard, Sport, Eco and Snow –- to vary throttle response and gearshift patterns to optimize performance for road conditions and preferences. Retuned vehicle-speed-sensitive power steering and updated independent-strut-front and multi-link-rear suspension systems with new shock absorbers and spring units give smoother ride control with less body movement when cornering. Safeguarding occupants is a top priority, with several advanced safety technologies now available through revised options packages, including a comprehensive predictive forward collision system with emergency braking and pedestrian detection; this technology watches the vehicle in front and tracks vehicle speeds to detect and help prevent or mitigate a collision. Around View monitor with moving object detection uses four wide-angle lenses mounted around the vehicle to provide a “birds-eye” view on the center console for a clear picture of nearby hazards during low-speed maneuvers. Backup collision intervention alerts the driver to crossing vehicles and other large stationary objects behind the vehicle when moving in reverse; if necessary, the system will automatically brake to help avoid or mitigate a collision. Assistive technology features include Infiniti Connection services with 24-hour automatic crash notification, emergency call, enhanced roadside assistance, stolen vehicle reporting, remote door lock/unlock, alarm notification, maintenance alerts, and scheduled maintenance notification. An especially handy feature is the “My Schedule” function that can automatically sync a user’s schedule through Google Calendar and provide navigation guidance to appointments. Infiniti’s “Personal Assistant” concierge service provides 24-hour access to a live team of professionals to provide assistance at the touch of a button from inside the vehicle or through the owner’s mobile or home phone. Personal Assistant services can also locate points of interest, find a restaurant, make the reservation, and send directions directly to the QX60’s hard drive navigation system. We drove the new model over a course of 125 miles in the San Antonio environs. Notable is its quiet, luxury-appointed cabin; its high level of technology and communications features; and its responsive ride and handling. Additionally, the premium model has numerous options packages that bring uplevel technology and equipment as well as elegant trims. The 2016 Infiniti QX60 is available in four models: QX60 (starting at $42,600), QX60 AWD ($44,400), QX60 Hybrid ($52,050), and QX60 Hybrid AWD ($53,450); destination and handling is $995. Rearview monitor, tri-zone temperature control, and a power sliding moonroof with tinted glass, one-touch open/close, tilt feature and sliding sunshade are standard on all models. Standard connectivity and entertainment features include Bluetooth hands-free connectivity, six-speaker AM/FM/CD audio, SiriusXM Satellite Radio, and USB connection ports for iPod interface and other compatible devices. Seven equipment packages and seven exterior colors allow customization according to individual needs and preferences.